Invisalign® is an esthetic alternative to braces that is virtually undetectable to others. A series of clear removable aligners are used to straighten your teeth without metal wires or brackets. 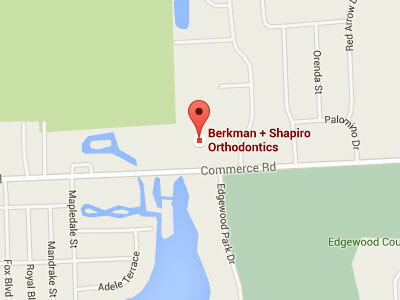 The aligners are custom made using Dr. Berkman’s or Shapiro’s expertise and 3-D computer virtual imaging technology. Once Dr. Berkman or Dr. Shapiro has determined that Invisalign® is the proper treatment for you, precise treatment instructions are sent to Invisalign® along with molds of your teeth. Invisalign® uses advanced computer technology to translate these instructions into a sequence of finely calibrated aligners. The number of aligners you will need to wear varies. You’ll usually wear each aligner for about two weeks and only take it out for eating, brushing and flossing. As you replace each aligner with the next, your teeth will move – gradually–week by week, until they move into the final alignment prescribed by Dr. Berkman or Dr. Shapiro. Then you’ll have the beautiful smile you have always dreamed of! To determine if Invisalign® can help you get the smile you’ve always wanted, call our office to schedule a consultation with Dr. Berkman or Dr. Shapiro.